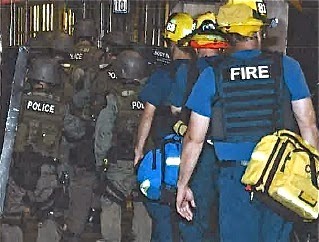 Around 10:00 p.m., Thursday night, May 1st - shortly after South Coast Plaza closed - more than 250 public safety members from the Federal Bureau of Investigation, local police jurisdictions and fire personnel participated in a multi-agency emergency response exercise at that venue. 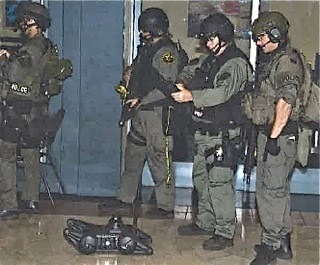 According to the press release issued by the Costa Mesa Police Department, the exercise involved a hypothetical terrorist-type attack scenario at South Coast Plaza - the second largest, highest-grossing shopping center in the country. 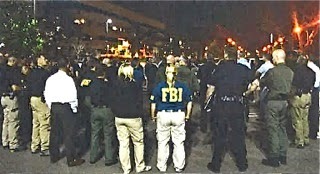 The FBI oversaw the event, partnering with local law enforcement, fire, emergency medical services and the private sector in the execution of the training exercise. This exercise provided an opportunity for the various agencies involved to demonstrate their ability to work "shoulder-to-shoulder" with each other in an effective, coordinated response. 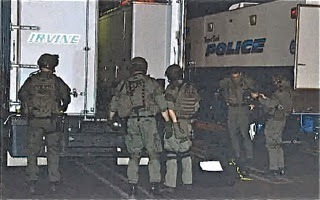 According to the press release, this involved cooperative planning by a unified command staff, as well as collaboration amongst involved police S.W.A.T. and Fire rescue teams from different agencies. Participating agencies managed various threat and rescue scenarios during the exercise. The overarching goal of the exercise was to rehearse mutual agency preparedness, and response and recovery efforts to effectively address a complex attack scenario. The exercise lasted into the early morning hours of Friday, May 2nd and provided a practical venue for individual agencies to assess best practices as well as areas for improvement. 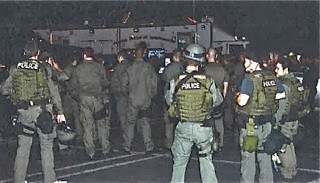 Simultaneously, as similar joint training exercise was conducted in Mission Viejo, at the Shops at Mission Viejo. 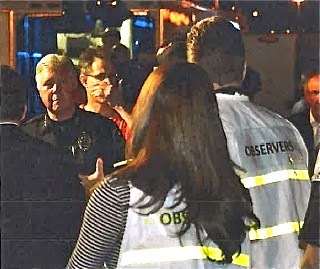 Command Staff at both locations coordinated with a unified command staff overseeing planning from a remote location in Orange. I'm grateful to those agencies involved for working together to prepare for such a scenario. We live in a troubled world, so these kind of exercises are, unfortunately, necessary. As we approach Costa Mesa Mayor Jim Righeimer's self-aggrandizing "Mayor's Celebration" - a dinner with the theme, "The Art of Leadership", to be held the evening of May 8th, I thought an article I read in the Wall Street Journal last Tuesday, April 29th, might be timely and enlightening. As I've said many times, The Wall Street Journal is the best publication I read regularly. The news is thorough and presented well - and timely. The editorials, most of which are conservative, are also well-written. The columnists are superb and the contributing commenters are usually excellent - experts in their fields. 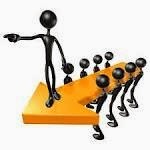 With that as a preamble, I read the commentary by Barry Glassner (President and professor of sociology at Lewis & Clark College) and Morton Schapiro (President and professor of economics at Northwestern University) titled "Leadership Tips for College Presidents and CEOs". I figured these two gentlemen just might know a thing or two on the subject - they did - so I'll share a thumbnail version for you here and hope I don't violate their copyright along the way. Their commentary was broken into a dozen segments. I'll give you the titles and snippets of their message for each. I think you'll find them relevant to circumstances in Costa Mesa today. I may offer a personal observation in bold red type. 1 - Think first, talk later. Everything you say will be taken literally. Don't ever think you're "off the record". Apparently learned very slowly. 2 - Talk less, listen more. Do not offer a grand plan before one exists. Yep! 3 - Show up. Every constituency wants you to be physically in the room on important occasions. 4 - Engage veteran employees. You want them on your side and you'll learn from them. Boy, ain't that the truth! 5 - Don't ignore the staff. In companies, they are the face of the business. In municipal government, too! 7 - Answer nearly all messages. This relates to the previous point. 8 - Use the board of trustees or directors. The board is your boss, and if you don't like that, then keep your resume up to date. Presume the "board" is your constituency - the residents. 9 - Community relations matter. Bad relations with the local community can interfere with everything - building projects, programming, the provision of public services. Maybe the most important point made in this commentary! 10 - Don't take things personally. Many bad things are going to happen and you will be blamed for most of them. Don't beat yourself up, and remember that things are never as bad as they look. 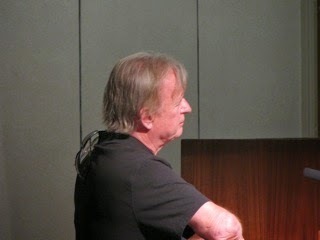 It Was A Great Day In Costa Mesa Last Monday! Last Monday was a very good day for one special 4-year old child in Costa Mesa, for police officers Matt Olin and Nicole Brown and for responding members of the Costa Mesa Fire Department. It's not every day that an officer gets to save the life of a child, but that's exactly what happened when Olin responded to a call of a non-responsive child in a backyard swimming pool recently. You can read the press release about the event HERE. 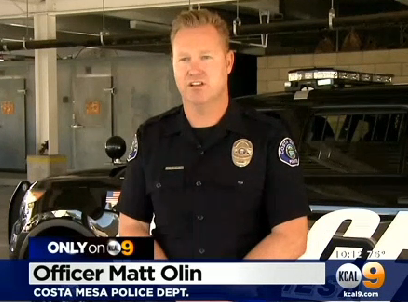 Kudos to Officers Olin and Brown, and to the members of the Costa Mesa Fire Department who also responded to the event and continued the care of the young girl who's life was saved on that day. It's a proud day for the men and women who provide public safety for the residents and visitors to our city. Thanks to them all. 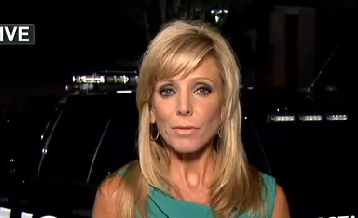 KCAL9's award-winning reporter, Stacey Butler, tells us the story on the news Thursday night. During the City Council meeting on April 15th Righeimer freaked out, reading part - but not all - of the comment in question and demanded an apology not only from me for my "heinous" crime, but from the four people who had the audacity and bad taste to "like" the comment, too. I wrote about it early the next morning, HERE. The Daily Pilot also wrote about it on April 16th, and included a video clip of Righeimer's rant, HERE. And, on April 23rd, the Daily Pilot published a commentary I submitted explaining that I have no intention of apologizing for the comment, HERE. This brings us back to Sesler's commentary, which, by the way, never does mention me by name, although it is very clear who he means. 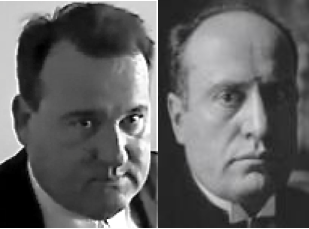 I was amused as I read Sesler's tirade, which criticizes me for comparing his benefactor, Righeimer, to a dictator while, simultaneously, comparing me to Joe McCarthy. Sesler postulates that "the average resident" perceives Righeimer as doing "a Herculean job of bringing Costa Mesa back from the precipice of financial disaster." Of course, in keeping with the Augean Stables metaphor, HERE, that's about as big a load of manure as one might attempt to pile on the pages of the Daily Pilot. Sesler chants the party line about "burning through millions of precious reserves", completely ignoring the fact that those reserves were there specifically for that purpose - to get us through tough times. 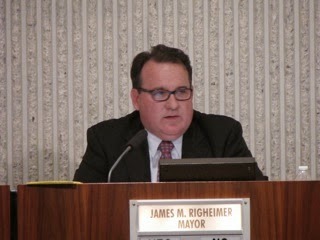 The economic downturn the end of the last decade, which was reflected in Costa Mesa by the precipitous drop in Sales Tax Revenues, was a calamity - but Righeimer didn't "fix it" - the rebounding economy did. What Righeimer did do, however, was create a huge retirement nest egg for several law firms by incurring significant legal bills for the city in amounts heretofore unseen in City history. Perhaps that's why lawyer Sesler was so quick to be at the front of the line for fanny-smooching with his commentary. Certainly, based on the comment thread attached to it - more than 50 as I write this and climbing - he's had to elbow his way past several other sycophants for that privilege. They're left to further obfuscate in that thread. Sesler raves about the wonderful job Righeimer, the dictator, has done paving our roads, but conveniently neglects to mention that the paving in question was already in the pipeline before he took office. He touts that the mayor is responsible for "rebuilding our rainy day reserves", but neglects to mention that those dollars came at the cost of reduced staffing levels throughout the City, mainly from Public Safety positions. The mayor, the dictator, prefers filling potholes to filling vacancies in the Police and Fire Departments. Today we have more than 50 open positions - well over 10% of the authorized, essential positions are vacant. He'd rather see a freshly-painted traffic lane line than have enough officers available on the streets to keep our city safe. It's apparently more important to him to be able to scamper around town quickly on new asphalt than for police officers to respond quickly to emergencies. What Righeimer HAS done, though, is create an upside-down organization, with the so-called "Executive Offices" staffed to overflowing with public relations guys and party planners. I mean, what city our size has a "Chief Executive Officer", two "Assistant CEO's" and a "Deputy CEO"? The answer is - NONE! One might say that those positions are necessary for effective oversight of the organization. Well, if that's the case, how did the now-notorious 60th Anniversary Celebration become such a financial (and potentially corrupt) disaster? Just who on the 5th floor was asleep at the switch on that one? Under Righeimer's regime they've done such a poor job of managing, with so many questions being raised, that they've actually had to add an additional Deputy City Clerk just to handle all the public records requests! These are NOT signs of a healthy, well-managed organization, and you can lay it all at the feet of Mayor Jim Righeimer and his council majority. I'm amused that Sesler, the sycophant, refers to me - quite tongue-in-cheek - as a "superhero", and that he and his running buddies have attempted to link me to the good folks at Costa Mesans For Responsible Government (CM4RG) - the non-partisan, grass roots organization that attempts to shine the light on the foibles and missteps being made by the current council majority. They are folks that actually study issues, participate on community committees, volunteer at community events and DARE to step to the speaker's podium and offer opinions to the City Council and commissioners. They are among those Righeimer derisively refers to as "the same dozen people" who speak to the council frequently. Of course, I am not part of that group, but I do admire much of what they are trying to do. I'm certainly not their "leader" - contrary to what a couple sycophants have implied recently. The good folks at CM4RG are quite capable of forming their own ideas, creating strategies and carrying them out without any help from me. I was NOT amused when Sesler criticized councilwoman Wendy Leece - not by name, of course - for defending my right to express my opinion of Righeimer and his actions. I'm actually amazed that Sesler - a lawyer who swore an oath to follow the law, not only in his day job, but as a Planning Commissioner, too - so willingly and enthusiastically supports Righeimer's efforts to quash any form of criticism. I guess taking an oath these days doesn't mean much - at least, not if we use Sesler and his pals as benchmarks. So, while I will re-emphasize that I have NO intention of apologizing to Mayor Righeimer, I DO want to thank sycophant Sesler for ripping the scab off that wound and for keeping it in the public eye. Every single day since this event first occurred one or more people - many of them complete strangers - have asked me about it, and wondered if Righeimer is REALLY that bad - is he REALLY like THAT dictator? Of course, I must honestly answer them, right? I tell them, NO, I don't think he would exterminate an entire population if given the opportunity, but, YES, his behavior mirrors many of the characteristics demonstrated by that most notorious of WWII dictators. And I give them examples of what I mean - there are plenty of them. And, I'd like to thank Sesler's fellow sycophants and boot-lickers - including a couple of his fellow-planning commissioners - who joined in on the comment thread of his commentary. 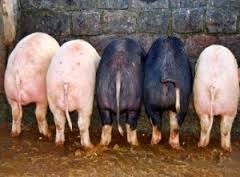 They practically shoved each other out of the way like so many hogs trying to get to the trough, as they tossed out the other party buzz words - like "hater" for example. Some of them use that term for anyone who expresses an opposing viewpoint. It only demonstrates the vacuousness of their arguments, so it makes me smile when they do it. 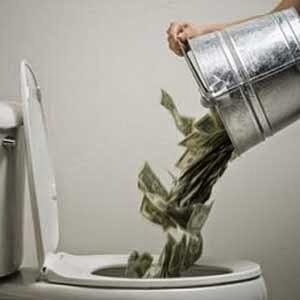 To Righeimer, Sesler and all their little friends, I say, please, please DO continue to kick this can down the road. Every time you rip the scab off it creates multiple opportunities to explain the issues to folks that we might otherwise not have had a chance to encounter. When they hear the truth - not the fabrications and obfuscations bloviated by you and your minions - they understand just how much damage you have done, and are doing, to our city. They understand your desire to put personal political agendas ahead of what is right for the city. They begin to understand how you act like rules are for someone else, but not you. Most of the folks who engage us in discussions, for example, simply cannot understand why the mayor of a city would have such a hard heart for the men and women who try to keep us safe - so we explain it to them. They cannot understand why you all have such ill will toward the loyal city employees - those who keep the wheels turning and have done so for decades - so we tell them. They don't comprehend the depths of our legal difficulties brought on by your actions, and the millions of dollars you've caused to be spent on lawyers - so we tell them. So, thank you for those opportunities - with the elections looming on the horizon, your timing is actually perfect. And, to Sesler and his buddies on the comment thread - please remember to carry sanitary wipes with you. 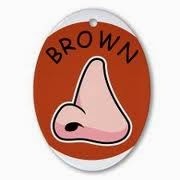 That brown stuff on your noses actually will probably rub off easily with a little elbow grease. Last night a small group - approximately 35 people - of mostly Eastside Costa Mesa neighbors gathered at Kaiser Elementary School to hear representatives of the City discuss plans to "calm" the traffic on East 19th Street from Irvine Avenue at the Newport Beach border to Newport Boulevard at the terminus of the 55 Freeway. 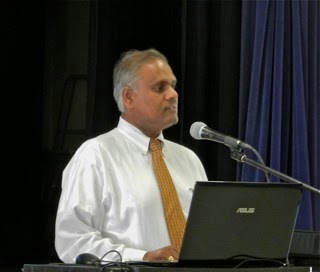 Transportation Services Manager Raja Sethuramin led the 90-minute discussion, which included a PowerPoint presentation of some options considered, and visitors had a chance to view story boards around the room that reflected plans for specific segments of that roadway, showed intersection improvements and plant selections being considered for this $855,000 project. 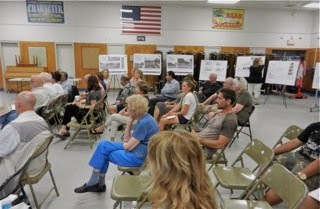 Most of the evening was taken up with a lively question and answer session in which the "success" of the recent Broadway project frequently was used as an example for this pending project. According to Sethuramin and residents of that street, the traffic calming measures taken have been effective for what was a very busy neighborhood street. 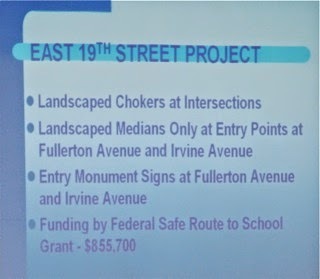 Plans for East 19th Street include the installation of traffic "chokers" at intersections, which will effectively slow down the flow by squeezing it by the throat at intersections. New center dividers will be installed at the ends of the street, at Fullerton Avenue and at the approach of Irvine Avenue. New community markers stating "Eastside Costa Mesa" will be installed in those landscaped dividers. Because 19th Street is narrower than Broadway - 10 feet or more according to one resident who was active on the Broadway project - there is no room for centerline planters as was done on that street. Residents expressed concern - just as many did at the first of these meetings in January - that slowing the traffic along 19th Street will simply force it to parallel streets, like Costa Mesa Street, Flower Street and 18th Street. According to Sethuramin, studies show that this likely will not happen - even though that flies in the face of logic. Several residents expressed concern about the increasing density of the housing on the Eastside. Very few have been seen at City Council or Planning Commission meetings when this issue has been discussed. So far, claims by residents that density is a serious problem have been rejected by the current council majority - Mayor Jim Righeimer specifically - as recently as the General Plan Land Use meeting Tuesday evening. Apparently, if he doesn't see several thousand people in the streets outside City Hall complaining about an issue, then it simply does not exist. Of course, he's equipped with blinders and earmuffs provided by his developer-buddies to prevent him from hearing that kind of stuff. Since the City is presently in the midst of updating the General Plan, now is the time for residents to express their views on issues like density, traffic, affordable housing, etc. They can do so by speaking at City Council meetings and/or Planning Commission meetings and by writing to the City Council. Contact information for them can be found HERE. 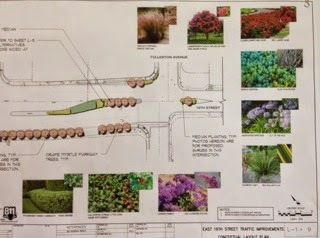 The next stop on this project will be the presentation by the staff of the landscape plans, including choices for the monument signs, to the Parks and Recreation Commission - probably at their meeting on May 24th. Interestingly, when Sethuramin tried to take the pulse of the audience to determine their preference of the four examples provided last night the results were almost equally split among all four. There certainly was no clear consensus by that group. Presuming that this project will go forward, and that the staff will successfully locate grant funding - mention was made of the Federal Safe Route To School program - construction won't begin until 2015. There's still plenty of time for those concerned to make their views known to the City Council and staff. 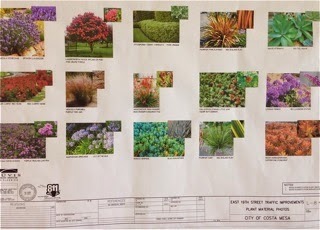 Information about this project will appear on the City Website. 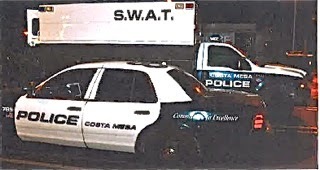 At a Special Study Session Tuesday beginning at 4:30 p.m. what was left of the Costa Mesa City Council heard staff reports, comments from residents and provided staff direction on each of the two items on the agenda. Approximately 60 people showed up for the meeting. Only Mayor Jim Righeimer, Mayor Pro Tem Steve Mensinger and Councilwoman Wendy Leece attended. Councilwoman Sandra Genis was absent due to illness and Gary Monahan, as mentioned in an earlier post, decided to stay at his pub for a fundraiser instead of attending this study session. 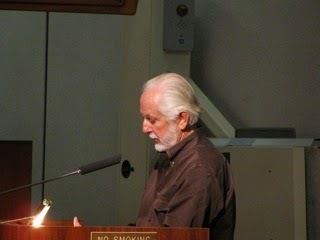 Righeimer, as he announced that fact, suggested that the audience adjourn to Monahan's bar after the meeting to support Kaiser and Woodland Schools. So, now we're publicizing bars from the dais... nice. First up was the plan - nobody said where this idea came from - to convert the Neighborhood Community Center (NCC) into a library and convert the nearby Donald Dungan Library into a community meeting venue. The representative from KAL Architects gave a detailed presentation about how the new facility would be laid out, more than doubling the existing library space. The staff report is HERE. 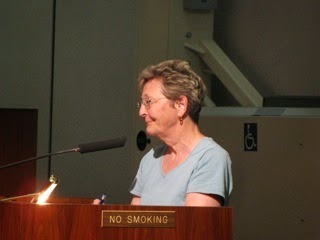 Ten residents spoke on the issue. 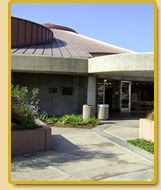 Members of the Costa Mesa Library Foundation and the Friends of the Library supported the idea. Others urged caution, suggesting that there was no compelling reason to do this at this time and we had no idea of the costs yet. One speaker suggested that the Mesa Verde Branch library should not be overlooked as talks of improving library facilities moves forward. Many spoke expressing concern about the displacement of the organizations which use the NCC for regular meetings. At an earlier meeting one member of the council implied that the NCC was underutilized. However, the staff report listed all the current users groups - 42 in all. Of those one, the Newport-Mesa Unified School District, rented space 141 days last year. Another four groups rented space from 50-74 days, three rented space from 22-32 days, nineteen rented space from 9-18 days and the remaining fifteen users rented space from 1-4 days. According to CEO Tom Hatch and Assistant CEO Tammy Letourneau, every effort will be made to assist those displaced find meeting quarters. Supporters bemoaned the fact that, due to a perceived lack of commitment by the city, there was an inability to come up with community financial support and the opportunity was lost to build a new, first-class library near the City Hall complex. It would have cost an estimated $50 million. Righeimer said, "If we don't do this now it will never happen." He then, in one of those stream of consciousness rants for which he is becoming infamous, he said we could do this for "$4-6 million, under $10 million", and that he was all for it. So, what we have here is a guy who pretends to be a fiscal conservative yet approaches a major project like this like a drunken sailor buying drinks for the house! I mean, what the heck - four million, six million, ten million - what's the big deal, right? Geez! The staff was given direction to come back with a Request for Proposals to spend somewhere in the amount of $100,000 for further architectural work. For more on this, see Bradley Zint's Daily Pilot article HERE. where it was welcomed with open arms. He now rents out his space to smaller businesses who also face the specter of being forced out by incompatibility of uses caused by a new, very expensive Senior Living facility next door. Residents also stepped up to complain that, among other things, the sentiments expressed to the consultants who conducted several community outreach meetings last year seemed not to be acknowledged nor reflected in the presentation. Several of them attended all the meetings - I attended all but one - and I agree. There seemed to be a major disconnect between what the consultants had consistently been told - no more increased density housing - to what was being presented last night. 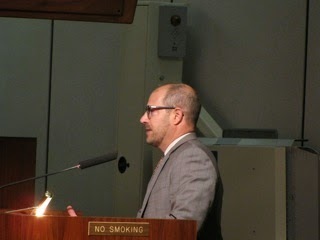 The final speaker was Mike Balsamo, representing the Building Industry Association - a trade group of more than 1,000 builders. He suggested that Costa Mesa was on the right track - what a surprise, considering the recent developments being considered in the city - and that the "Millennials" want things like Live/Work units because they are marrying later and having families later. None of that made the business owners very happy, though. During his comments Righeimer said he had attended 4-5 of the outreach meetings - I don't recall that being the case - and he said there were only 10, 12 or 30 people attending and there was no "outcry" about density. Well, he didn't attend the meetings I attended, because there was, indeed, an outcry about what appeared the plans for more high density housing. And, once again, he plays fast and loose with the numbers! He launched off into a rant about the state needing to do more to attract businesses to California - while he was in the process of putting together a General Plan that will squeeze out existing businesses from Costa Mesa! He cited diminished "trips" in several of the areas discussed, but Gary Armstrong - Director of Economic Development - and Ernesto Munoz - Director of Public Services - acknowledged that the statistics used for those "trips" were estimates, not the result of specific, costly traffic studies. So, we're now pulling numbers out of the air and basing major planning decisions for the future of the city on them. Yikes! I won't attempt to discuss each element in detail. You can read the staff reports and the proceedings were shown live on CMTV and will be available for viewing in the local outlet rotation and also via streaming video shortly. Watch it yourselves for the details. According to the staff report, this plus Focused Zoning Update and additional Great Reach (outreach) Events will cost nearly $150,000 and the process will stretch into the first part of next year. The staff will bring back the request for the increase at a future meeting. The Study Session, normally a couple hours, stretched to nearly four this time because greater opportunity was provided for public comments on each item. That was a good change on the part of the mayor.... that's "one", for those keeping track. And, the meeting likely would have run even longer if Genis had been there. This stuff is right in her wheelhouse and she'd have had significant contributions to make. 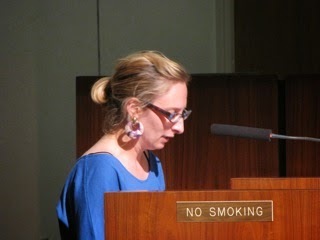 As it was, Righeimer read her short prepared statement into the record without comment.